An alarm clock (alarm for short) is a clock that is designed to alert an individual or group of individuals at specified time. The primary function of these clocks is to awaken people from their night's sleep or short naps; they are sometimes used for other reminders as well. Most use sound; some use light or vibration. Some have sensors to identify when a person is in a light stage of sleep, in order to avoid waking someone who is deeply asleep, which causes tiredness, even if the person has had adequate sleep. To stop the sound or light, a button or handle on the clock is pressed; most clocks automatically stop the alarm if left unattended long enough. A classic analog alarm clock has an extra hand or inset dial that is used to specify the time at which to activate the alarm. Alarm clocks are also found on mobile phones, watches, and computers. Many alarm clocks have radio receivers that can be set to start playing at specified times, and are known as clock radios. Some alarm clocks can set multiple alarms. A progressive alarm clock, can have different alarms for different times (see Next-Generation Alarms) and even play music of your choice. Most modern televisions, mobile phones and digital watches have alarm clock functions to turn on or make sounds at a specific time. The Obelisk of Theodosius, detail of the pedestal: Theodosius I offers laurels of victory; we can see the water organ of Ctesibius, in the lower right-hand corner. The ancient Greek philosopher Plato (428–348 BC) was said to possess a large water clock with an unspecified alarm signal similar to the sound of a water organ; he used it at night, possibly for signaling the beginning of his lectures at dawn (Athenaeus 4.174c). The Hellenistic engineer and inventor Ctesibius (fl. 285–222 BC) fitted his clepsydras with dial and pointer for indicating the time, and added elaborate "alarm systems, which could be made to drop pebbles on a gong, or blow trumpets (by forcing bell-jars down into water and taking the compressed air through a beating reed) at pre-set times" (Vitruv 11.11). The late Roman statesman Cassiodorus (c. 485–585) advocated in his rulebook for monastic life the water clock as a useful alarm for the 'soldiers of Christ' (Cassiod. Inst. 30.4 f.). The Christian rhetorician Procopius described in detail prior to 529 a complex public striking clock in his home town Gaza which featured an hourly gong and figures moving mechanically day and night. In China, a striking clock was devised by the Buddhist monk and inventor Yi Xing (683–727). The Chinese engineers Zhang Sixun and Su Song integrated striking clock mechanisms in astronomical clocks in the 10th and 11th centuries, respectively. A striking clock outside of China was the water-powered clock tower near the Umayyad Mosque in Damascus, Syria, which struck once every hour. It was constructed by the Arab engineer al-Kaysarani in 1154. In 1235, an early monumental water-powered alarm clock that "announced the appointed hours of prayer and the time both by day and by night" was completed in the entrance hall of the Mustansiriya Madrasah in Baghdad. From the 14th century, some clock towers in Western Europe were also capable of chiming at a fixed time every day; the earliest of these was described by the Florentine writer Dante Alighieri in 1319. The most famous original striking clock tower still standing is possibly the one in St Mark's Clocktower in St Mark's Square, Venice. The St Mark's Clock was assembled in 1493, by the famous clockmaker Gian Carlo Rainieri from Reggio Emilia, where his father Gian Paolo Rainieri had already constructed another famous device in 1481. In 1497, Simone Campanato moulded the great bell (h. 1,56 m., diameter m. 1,27), which was put on the top of the tower where it was alternatively beaten by the Due Mori (Two Moors), two bronze statues (h. 2,60) handling a hammer. User-settable mechanical alarm clocks date back at least to 15th-century Europe. These early alarm clocks had a ring of holes in the clock dial and were set by placing a pin in the appropriate hole. The first American alarm clock was created by Levi Hutchins, of New Hampshire, in 1787. This device he made only for himself however, and it only rang at 4 AM, in order to wake him for his job. The French inventor Antoine Redier was the first to patent an adjustable mechanical alarm clock, in 1847. Alarm clocks, like almost all other consumer goods in the United States, ceased production in the spring of 1942, as the factories which made them were converted over to war work during World War II, but they were one of the first consumer items to resume manufacture for civilian use, in November 1944. By that time, a critical shortage of alarm clocks had developed due to older clocks wearing out or breaking down. Workers were late for, or missed completely, their scheduled shifts in jobs critical to the war effort. In a pooling arrangement overseen by the Office of Price Administration, several clock companies were allowed to start producing new clocks, some of which were continuations of pre-war designs, and some of which were new designs, thus becoming among the first "postwar" consumer goods to be made, before the war had even ended. The price of these "emergency" clocks was, however, still strictly regulated by the Office of Price Administration. The first radio alarm clock was invented by James F. Reynolds, in the 1940s and another design was also invented by Paul L. Schroth Sr.
"Clock radio" redirects here. For the clocks synchronised by radio signals, see radio clock. A mid 1940s alarm clock radio with AM radio stations only. A clock radio is an alarm clock and radio receiver integrated in one device. The clock may turn on the radio at a designated time to wake the user, and usually includes a buzzer alarm. Typically, clock radios are placed on the bedside stand. Some models offer dual alarm for awakening at different times and "snooze", usually a large button on the top that silences the alarm and sets it to resume sounding a few minutes later. Some clock radios also have a "sleep" timer, which turns the radio on for a set amount of time (usually around one hour). This is useful for people who like to fall asleep while listening to the radio. Newer clock radios are available with other music sources such as iPod, iPhone, and/or audio CD. When the alarm is triggered, it can play a set radio station or the music from a selected music source to awaken the sleeper. Some models come with a dock for iPod/iPhone that also charges the device while it is docked. They can play AM/FM radio, iPod/iPhone or CD like a typical music player as well (without being triggered by the alarm function). A few popular models offer "nature sounds" like rain, forest, wind, sea, waterfall etc., in place of the buzzer. A modern clock radio features a radio/iPod/buzzer as alarms. Clock radios are powered by AC power from the wall socket. In the event of a power interruption, older electronic digital models used to reset the time to midnight (00:00) and lose alarm settings. This would cause failure to trigger the alarm even if the power is restored. Many newer clock radios feature a battery backup to maintain the time and alarm settings. Some advanced radio clocks (not to be confused with clocks with AM/FM radios) have a feature which sets the time automatically using signals from atomic clock-synced time signal radio stations such as WWV, making the clock accurate and immune to time reset due to power interruptions. Alarm clock software programs have been developed for personal computers. A computer acting as an alarm clock through a website may allow a virtually unlimited number of alarm times (i.e. Personal information manager) and personalized tones. Many modern mobile phones feature built-in alarm clocks that do not need the phone to be switched on for the alarm to ring off. Some of these mobile phones feature the ability for the user to set the alarm's ringtone, and in some cases music can be downloaded to the phone and then chosen to play for waking. Scientific studies on sleep having shown that sleep stage at awakening is an important factor in amplifying sleep inertia. Alarm clocks involving sleep stage monitoring appeared on the market in 2005. The alarm clocks use sensing technologies such as EEG electrodes and accelerometers to wake people from sleep.Dawn simulators are another technology meant to mediate these effects. Sleepers can become accustomed to the sound of their alarm clock if it has been used for a period of time, making it less effective. Due to progressive alarm clocks complex waking procedure, they can deter this adaptation due to the body needing to adapt to more stimuli than just a simple sound alert. The deaf and hard of hearing are often unable to perceive auditory alarms when asleep. They may use specialized alarms, including alarms with flashing lights instead of or in addition to noise. Alarms which can connect to vibrating devices (small ones inserted into pillows, or larger ones placed under bedposts to shake the bed) also exist. Time switches can be used to turn on anything that will awaken a sleeper, and can therefore be used as alarms. Lights, bells, and radio and TV sets can easily be used. More elaborate devices have also been used, such as machines that automatically prepare tea or coffee. A sound is produced when the drink is ready, so the sleeper awakes to find the freshly brewed drink waiting. An alarm clock as the emblem of the Nationalist Congress Party in India. ^ a b Hodkin, Thomas (2015). Collecting Clocks Clock Repairs & Trademarks Index. Lulu.com. ISBN 9781326252496. Retrieved 17 August 2018. ^ "Monastic Alarm Clocks, Italian" Archived 21 November 2008 at the Wayback Machine, entry, Clock Dictionary. ^ Mary Bellis. "History of Clocks". Retrieved 2 November 2006. ^ "A 2,000-Year History of Alarm Clocks". Atlas Obscura. 21 April 2016. Retrieved 15 August 2018. ^ "A Rude Awakening – The History of Alarm-Clocks". Throughout History. 10 March 2014. Retrieved 15 August 2018. ^ a b c "The-Clock-that-Caused-a-Near-Riot" ""The Clock that Caused a Near-Riot" | westclox". westclox. Retrieved 15 August 2018. ^ "Find the time to scour antique shows for vintage alarm clocks – Antique Trader". Antique Trader. 6 July 2010. Retrieved 15 August 2018. ^ Survey of Current Business. U.S. Department of Commerce. 1955. pp. 21–22. Retrieved 15 August 2018. ^ Ha, Peter (25 October 2010). "All-TIME 100 Gadgets – TIME". Time. Retrieved 15 August 2018. ^ Cecil Adams (26 November 1999). "Why does the alarm clock snooze button give you nine extra minutes, not ten?". The Straight Dope. Archived from the original on 31 December 2006. Retrieved 7 January 2007. 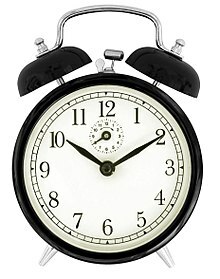 ^ "Use One of These Free Online Alarm Clocks to Wake Up on Time". www.lifewire.com. Lifewire. Retrieved 16 August 2018. ^ "Why Are Alarm Clocks Still a Thing?". Motherboard.vice.com. Motherboard. 10 April 2015. Retrieved 16 August 2018. ^ "Hot to Set the iPhone Alarm Clock to Use Songs". www.lifewire.com. Lifewire. Retrieved 16 August 2018. ^ Reuven Fenton (29 August 2007). "Bio-alarm clocks set for perfect wake-up". Reuters. Retrieved 9 June 2008. ^ Nam, Yunyoung; Kim, Yeesock; Lee, Jinseok (23 May 2016). "Sleep Monitoring Based on a Tri-Axial Accelerometer and a Pressure Sensor". Sensors (Basel, Switzerland). 16 (5): 750. doi:10.3390/s16050750. PMC 4883440. PMID 27223290. ^ "Wakey, wakey! Wake up refreshed with a brain-monitoring alarm clock". phys.org. Retrieved 17 August 2018. ^ Avery DH, Eder DN, Bolte MA, Hellekson CJ, Dunner DL, Vitiello MV, Prinz PN (August 2001). "Dawn simulation and bright light in the treatment of SAD: a controlled study". Biological Psychiatry. 50 (3): 205–216. doi:10.1016/S0006-3223(01)01200-8. PMID 11513820. ^ Dulken, Stephen Van (2001). Inventing the 19th Century: The Great Age of Victorian Inventions. British Library. p. 72. ISBN 9780712308816. Retrieved 17 August 2018. ^ Skaggs, Ernest Burton (1933). A Text Book of Experimental and Theoretical Psychology. Edwards brothers Incorporated. p. 156. Retrieved 17 August 2018. ^ Orin, Andy. "Does the Snooze Button Turn You into a Zombie?". Lifehacker. Retrieved 17 August 2018. ^ "Progressive Alarm clocks". Retrieved 17 August 2018. ^ "Alerting devices for the hearing impaired". Healthy Hearing. Retrieved 15 August 2018. ^ "Vibrating alarm clocks to help deaf children wake up". NDCS.org.uk. Retrieved 15 August 2018. ^ "Best Coffee Makers, Cool Alarm Clock Technology". Retrieved 17 August 2018.